American Stonecraft started a new yearly tradition called Mending Wall Day, set for March 26th, in celebration of the birthday of 4-time Pulitzer Prize winning poet Robert Frost. Geologist Robert Thorson estimates that there are more miles of stonewalls in the six states of New England than miles between the earth and moon. These walls were erected because fieldstones are less dense than the soil, and are perpetually pushed upward through the freeze-thaw cycle of the soils. Stonewalls were built by hand from these fieldstones and have become a cultural icon of the Northeast. 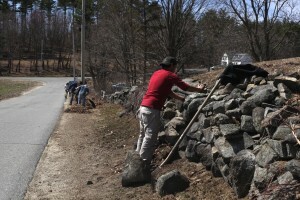 Mending Wall Day seeks to increase cultural awareness of the stonewall by organizing independent community gatherings where neighbors gather to rebuild and tend to fieldstone walls in visible public settings. “Robert Frost helped define the cultural landscape of rural New England,” according to American Stonecraft’s founder, Gerald Croteau III. “A poet born in San Francisco, Frost lived most of his life on farms throughout New England. He wrote poems featuring the fieldstone walls of his landscape, such as one of his most famous titled Mending Wall. “2015’s vernal equinox will occur on March 20th, so the date of Mending Wall Day is scheduled to take place in early spring when farmer’s traditionally cleared the winter’s crop of stones and piled them into new walls or added to existing ones. We may not commonly live as rural a lifestyle, but this day can bring us back to our roots, and help bring more awareness to the comforts of modern life and remind us of the chores that no longer need tending to,” says Croteau. There is a small stonewall-lined cemetery on the edge of Tully Dairy Farm in Dunstable, MA. However over time, stones fell down, brush became in need of clearing, and brown leaves needed to be raked away. On April 16th, the date delayed due to heavier than expected winter snowfall, American Stonecraft artisans performed a community service project to re-build the stonewall surrounding the cemetery and kickstart the inaugural celebration of Mending Wall Day. 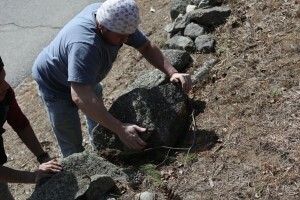 6 members of the studio and 2 members of Tully Farm cleared away debris and replaced the fallen fieldstones on the wall. Rebuilding the stone wall around the cemetery is appropriate community service and allows us to (finally!) work outside in the warm spring sun. The studio selected Tully Farm because the Tully Family have been farming nearby for generations and community is very important to them; George Tully was a charter member of the Dunstable Rural Land Trust, and his grandson Charlie Tully has served on the Grange and the Middlesex County Farm Bureau. They like sharing their farm with the community and students. 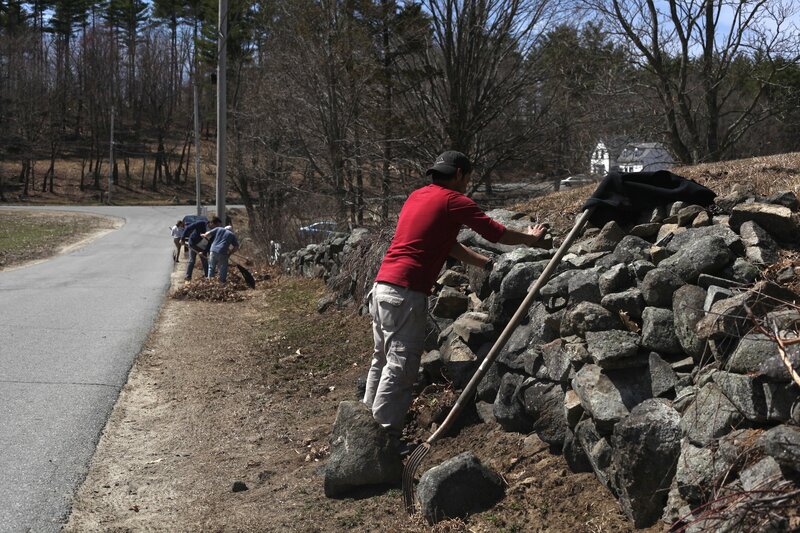 We look forward to continuing this tradition in years to come by organizing independent gatherings where neighbors gather to rebuild and tend the public stone walls throughout New England in celebration of our farming history. This entry was posted in Community Service and tagged farm, Massachusetts artists, new england, robert frost, stonewall.